Dredge is a historical powerhouse in Vintage. Graveyard mages fueled by the unholy alliance of Ichorid, Bazaar of Baghdad, and Golgari Grave-Troll have consistently put up results. The deck has fought Mishra’s Workshop decks for the title of ‘Premiere Colorless Deck’ and occasionally won – including a Vintage Championship. There have been many iterations of the deck, with the non-Dredge maindeck components being the key marker that set one apart from another. In some cases this has consisted of free disruption like Chalice of the Void and Unmask. In others acceleration like Breakthrough and Brainstorm is the norm. In the current environment, it most often consists of anti-hate cards like Nature’s Claim, Ingot Chewer, and Chain of Vapor. Of course, the graveyard portion of the deck is highly modular and virtually anything can be run in the remaining space, provided the mana costs and mana-production align. I have chosen to run free counterspells such as Force of Will, Mindbreak Trap, and Mental Misstep. Force of Will provides a very powerful effect, one long sought in Dredge but rarely utilized. With Narcomoeba, I have 16 total blue cards, which is a reasonable minimum to support Force. This deck is tuned to trump each of the different ways that Dredge can lose matches, and to fully exploit the current environment to harvest free wins. The deck features the full set of Bazaar of Baghdad and Serum Powder, but also runs Library of Alexandria to provide even more hands worth keeping. Against the vast majority of the field Library is fast enough to win most games, especially with free counterspell support. Shy of adding significant spell-based discard like Careful Study, this is the maximum level of consistency possible. Hate cards like Leyline of the Void and Grafdigger’s Cage are the bane of most Dredge decks. However, the fact that these cards come in during sideboarding creates a tactical weakness – a transformative sideboard can be played to attack the near-helpless opponent. Both decks will frequently contain a plethora of dead cards post-sideboard, but the Dredge player can come prepared with Bazaar of Baghdad and Library of Alexandria to power through the chaff and reliably present the Marit Lage combo. 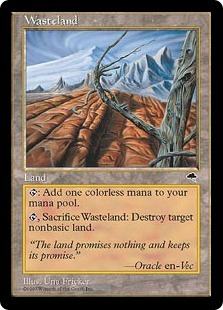 Wasteland is a powerful threat against Dredge-based decks in Vintage, which rely heavily on specialty lands. With maximum numbers of Petrified Field and Library of Alexandria, this build has very high resilience to land-denial tactics. Only when backed with high amounts of pressure is Wasteland reliable against the Manaless version of this deck. Post-sideboard, it stops the Marit Lage combo but can often be played around or through. If there is minimal graveyard hate, post-board games will instead play out like Game 1 with very good chances for the Dredge player despite Wasteland. With arguably 16 free counterspells, a fast clock, and Dread Return bringing back a flying Lodestone Golem (in the form of Chancellor of the Annex), this is perhaps the worst possible matchup for fast combo decks. These decks frequently lack graveyard hate, land disruption, or other key interactive elements. As a result, these matches are often favorable for the Manaless Dredge player. This deck picks up perhaps the greatest number of free wins of any deck in the current environment. It can do monstrously broken things, while presenting significant disruption along the way. Opening-hand Chancellor of the Annex is often worth a turn and sometimes worth a game against opposing hands that rely too strongly on Tolarian Academy, Mishra’s Workshop, or Black Lotus. Force of Will provides some number of free wins as well – totally halting opposing trumps as well as the occasional graveyard hate card. Mental Misstep can score the occasional easy win as well, invalidating hands that rely too strongly on Ancestral Recall, Ponder, or the top-of-deck tutors. Finally, Dredge as a strategic group invalidates permission and most cost-increasing cards. Turn 1 Trinisphere is a minor annoyance rather than a genuine threat, something few other decks can combat so readily. The goal is to be maximally consistent and to use Vampire Hexmage to win the Bridge from Below war via instant-speed sacrifice. The counters are dead and the Petrified Field are generally too slow, so they get cut for the second set of combo cards. Chancellor is still strong as an anti-Dread Return tactic, so it stays in for reanimation. The goal is to steal either game 2 or 3, which should be relatively straightforward. This is perhaps the matchup which most rewards clever and insightful sideboarding. Unlike Dredge or Blue Control, this guide is not a fixed plan that can be executed over and over but instead a common first step as part of a broader sideboard usage that varies from match to match. This is another match where sideboarding becomes highly reactive and contextual. Often, you will cut most of the counters to double up on combo opportunities. I have presented one way to do that here. As indicated above, this is a great matchup right out of the box. If you believe they have noteworthy hate, you can swap in the Marit Lage package similar to the build against Blue Control. I have placed 3-1 in a number of Daily Events and accumulated some 4-0 finishes such as this one. Unfortunately it seems that not all Daily Events are published. Given that some influential Vintage authors such as Brian DeMars treat 4-0 in a Daily as a threshold for metagame impact, we can expect to see increased publicity and popularity for some or all elements of my approach to Manaless Dredge. You can expect to face opponents inspired by this approach at some point. Based on my winnings and the number of events I’ve entered, I estimate my match win percentage to be approximately 65%. I believe this is past the threshold for format dominance, and the metagame will have to adapt if this style of Manaless Dredge becomes popular and succeeds at that level. If you’re interested in a Dredge deck that has matchups ranging from good to great, doesn’t fold to graveyard hate, and packs the mother of all counterspells, then this is the deck you’ve been looking for. Give it a try, and let me know how it performs for you.